If you’re based in the US and traveling to Canada for more than a few days, I strongly recommend you contact your mobile provider and sign up for their Canada plan. 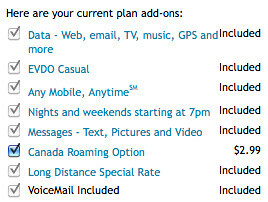 Sprint offers a $2.99 and T-Mobile offers $5.00 Canadian roaming plan (link to Sprint Canada Roaming option) where you pay $0.09 to $0.20 per minute on calls made and received in Canada. Both Sprint and T-Mobile allow you to add and remove the Canada plan whenever you want and won’t renew your contract. I am sure the other carriers (Verizon and AT&T) have the same deals. I carry a BlackBerry on the Sprint network and do not have to pay for international data since I’m traveling on the BlackBerry network when I’m in Canada. On my most recent trip, I also found out that I didn’t have to pay for SMS sent from Canada to USA mobile numbers. I’m not sure if it was a system glitch, but I’ll take it – and I’d welcome anyone who can provide additional info on this. And if you’re visiting Vancouver, you may want to check out these fine Vancouver eateries.